That’s a long time to live with a dog. Seven whole decades. A lifetime; and now he sits in the waiting room of the local – and I should add, excellent – dog rescue, waiting to see if he can have one more. Just one more. He has a stick. He looks your typical pensioner. Appearances, though: one can polarise one’s thinking so easily, can’t one? Ah, so there was a waiting room, even out of hours. How kind. I sat down, and we got to talking. “Which one are you after?” he said. He didn’t answer directly. He had come two weeks ago to find a dog but they had looked at him and said a big dog might be a hazard for him; wouldn’t he like something smaller? Each query, he said, hurt rather like a knife. And so he was back, hoping for a collie to go with him wherever he went. And a collie had arrived that morning, sent from Ireland on a ferry, complete with pet passport, to save it being put down. He had come a very long way – in British terms, that is. He had started out two hours before from the outskirts of London, and paid £20 for a taxi to get himself from the station to the rescue. “I had to walk across the fields to get to the bus, get a bus to the station, and then get a taxi when I got to this end,” he said. Fields, I asked? He lived surrounded by fields? Indeed he did. And behind his house runs the river which supplies the great ornamental ponds of Hampton Court. There are some beautiful places on the outskirts of London, if you care to look. The Colne Valley is one of them. And if that collie made its way to him, it would have all those fields and that river. The gentleman walks miles every day. Yet the rescue, responsible for the welfare of the people they home dogs with as well as the dogs they home, was reticent to home such an active, bouncy dog as a collie with someone who looked as if they might be knocked over by such a weight of canine enthusiasm. But my gentleman had lived with active, bouncy dogs for 70 years, he told me. How was he supposed to live without one now? The staff came to meet us. Which dog was I interested in, they asked, and I said, Freddie please, and was led off. As I left, I heard another of the staff talking to the old gentleman. “Would you consider something smaller?”she was saying, kindly. But then, she didn’t know about the Colne, or the miles he had walked today to get to the bus stop, or the knife in his heart. Life is many things, but it is not fair. 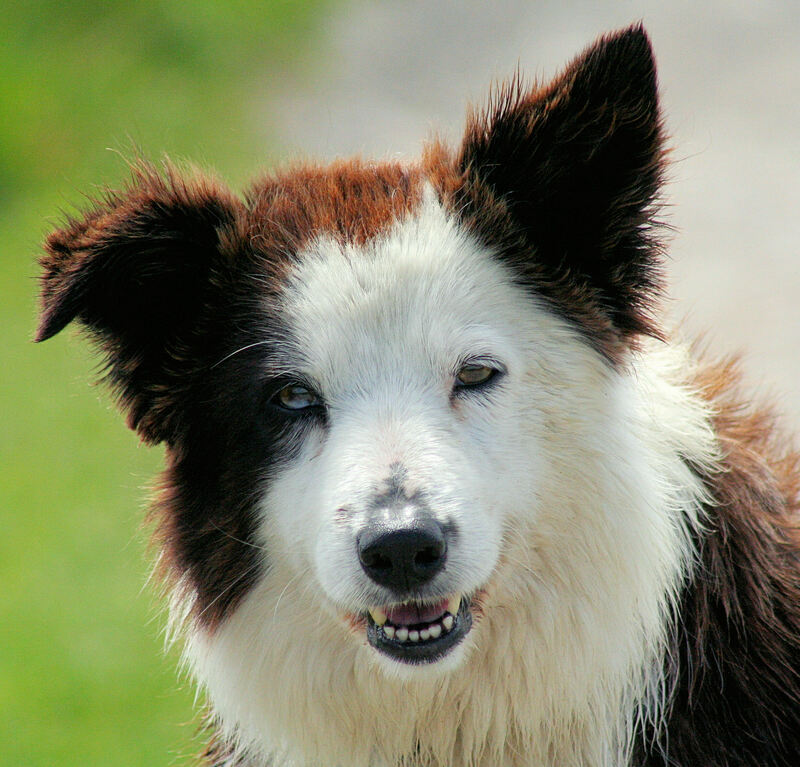 Posted in Shrewsday MansionsTagged collie, dog rescue, dogs, england, pets, UKBookmark the permalink. I’m not at 70 years with a dog but I’m heading that way. Big and small, don’t ever want to be without a dog. Had 5 years with no dog and it was miserable. I’ve got a very elderly 75 pound PitBoxShepAmute (his mother was a pit bull and boxer mix and his father was a shepherd and malamute mix), he’s 14 now and I’m hefting his heavy self up and down, but he’s still a happy boy. PitBoxShepAmute! Now there’s a breed. Glad he’s happy. It’s good when a dog falls squarely on his four paws 🙂 They make us happy don’t they? I never want to have to make that choice to be without a dog. They define our lives in some way, Cameron, don’t they? They are the spirits of the phases of our lives, I feel sure. I grew up with a jack russell, the spirit of my childhood, then a dappy mongrel called Paddy who ran tight circles round and round my teenage years in sheer jubilation; Mac took over as soon as we could commit to caring for a dog again, and is the spirit of our young family. Today we went back to the rescue and the collie was booked by someone, though I have no way of knowing whether it was my gentleman. I hope so. When Cat died and I was registering my interest for future ref at various shelters, I heard a woman who was keen to take home a young cat being asked her age, and then being told she would only be allowed an older cat. This despite the fact that her daughter was with her and stated clearly she would take the cat on if there was a problem. I understand the shelters concerns, but sensitive interviewing, calls to the vet who this man has taken his dogs to down the years, could mean a homed collie and a happy seventy-year-old. Have you adopted another dog? I hope nothing is amiss with Macauley. Thank you for asking, Isobel, Macaulay is just fine. He is nearly ten now, though, and has slowed, showing signs of becoming an old man before his time. So we want to bring a young dog into the family, one with whom Mac is happy and who brings out the youngster in him all over again. We have been waiting for some time for the right one- more than a year, in fact – and we think Freddie, an affable retriever cross with the sweetest nature, might be our man. We still have to pass all the home check tests, though, so we have to wait to see if he is destined to live with us! This brought tears! That man and that collie seem fated for one another. I hope it happened. So do I, Elizabeth. I went back today and there was a ‘booked’ notice on the collie. Perhaps they sent someone out for a home check: I hope so. I am picturing the lovely man returning to his home with the collie. Because otherwise I will be heartbroken. It nearly broke my heart to be there with him, Silver. I hope your picture is right. Tears here, too, Elizabeth! There have been great gaps in my life when no dog shared my home. In my mind, a working Mom with young kids in daycare or in school all day should not bring a dog into the mix if it must spend 9 or 10 hours alone almost daily. So, Skye, didn’t come along until my boys were older, and we lost her to illness way too soon. Minnie, my current companion has been with me since she was 8 weeks, and her 11th birthday is fast approaching. I cannot imagine life without her. I understand the cautions employed by the shelter as they screen potential adopters, but oh, how I hope someone there (besides you, Kate) truly “listened” to this gentleman and recognized the golden opportunity for this pup. You and me both, Karen. And today when we went along, the collie was booked by someone. Let us hope it was him. I hope that hearts unite and the gentleman hard work doesn’t go to waste. It also seems that Master Mack is in for some more company, no? Mac has met Freddie and it was more than cordial, Rafael. They began with Freddie reverently shadowing Mac’s every move as they pottered round the paddock: and ended with them both grinning doggily, and Mac showing some of the most positive body language I have seen for quite some time. Now only two barriers remain: a home check to be sure the house is suitable for Freddie to join us, and whether Montgomery the household cat will get on with him. I shall, of course, keep you posted! This is your local shelter, but the man isn’t “local” by your account. Why not help? The shelter is much more accessible to you than it is for him. You have all this marvelous communication technology, an automobile, the ability to make a difference, and he needs a dog. Excellent point, Michael. I did offer a lift as he left but I think he prefers being under his own steam, as it were. As for being instrumental in his getting a collie: the shelter is meticulous in its home checks – we’re expecting one imminently- and a visit to his home will give the shelter a good idea of the lush surroundings and active lifestyle my gentleman leads. If, following that, they continue to recommend a smaller dog – I would trust their judgement, though it would be sad to say goodbye to life with a collie. He’ll get a dog all right: but the shelter staff will be sure it is the right one. I suppose if he’s denied his collie, he could still get one that’s a pup, but I hope he’s permitted to take in the shelter dog. His heart is certainly in the right place. I hope that his home passes inspection and that one day you run into him again, but walking with his collie. Glad to hear that Mac and Freddie have hit it off. Maybe a protege is the tonic Mac needs. An added plus is that he can pass on his skills at retrieving dead deer bones. Monty, on the other paw, might not be that enamored of this new edition to the Shrewsday kennel. Virginia, you have hit the nail upon the head. Freddie arrives tomorrow, and introductions will have to be made very carefully and with treats on both sides. Hope all’s well with you. Did you get the snow when it came? Must catch up with LameAdventures, I miss its perspectives on NYC! I’m getting tunnel vision with this new job. Museum and Heritage jobs tend to start to dominate your whole life if you’re not careful and I haven’t got the balance half right yet. I’ve never thought of collies as particularly bouncy. They’re sweet and affectionate and loyal and protective. Tripping over a small dog is just as likely to happen as being knocked down by a collie. The man is like Mac, needing a special dog to keep the spring in his step. The shelter staff should watch Lassie Come Home and remember how important the right dog is and give the gentleman what he wants. But I don’t run things, so I don’t get to say. As to Montgomery, it’s only natural for a cat named for a military hero to assert himself in the presence of the enemy. But Mac, with all his experience, will probably advise Freddie to just surrender and save himself a lot of trouble. Let us hope so, Kathy. Introductions will have to be very careful! Oh how sad. I wish I had the means to somehow give that man the collie he wants. Breaks my heart to think of his loneliness. I spend every Sunday walking dogs at the local shelter. Finding the right dog in a shelter is like meeting your sweetheart. Sometimes there’s no rhyme or reason. There’s one thing I’ve learned it’s that sometimes you can’t predict which matches are made in heaven. I hope he gets his collie soon. Dog and human would be lucky to have each other. Look forward to stories about Freddie. Oh, I do hope the shelter people listened as well as you did. Well-meaning people can be particularly stupid. It is not only the person they need to match to the collie, but the environment. With fields and a nice sploshy river, the elderly (relatively) person has the ideal one. If I can cope with two collies plus the rest, he certainly can! Rescue dogs are very loyal to their new families. I’m sure Monty is now a bit out of sorts with two dogs within His domain. Oh my goodness this upsets me. I struggle, as I think most of us do, with the notion that one can be sized-up based on a birth date when we are so much more than that. Giving this dear man the dog of his heart would add years to his life, or at least to the quality of his life. A rescue dog is such a loyal friend. This story makes my heart ache, but I hope this gentleman is not alone, whether his new pal is small or the large. And good for you to have brought home a new friend, too?